I could never convince my mother to get me a BMW in high school. She had a BMW in high school, I would argue. But hers had a top speed of around 55 mph, provided there was a strong a tail wind. Mom had a BMW Isetta 300, and I finally got to see why she loved it so much when I drove one at the Lane Motor Museum. [Full disclosure: the Lane Motor Museum invited us out for their 3rd Annual Media Rally ahead of their Microcar Mania exhibit, which starts on May 25, 2017. They fed us lunch and dinner and let us drive a selection of amusing microcars, including the Isetta. Mom’s Isetta, named “Myrtle.” Photo via Wanda Schrader. Mom’s Isetta originally belonged to an uncle who drove it to Texas from California. When the Isetta broke down in the north-Texas town of Vernon, Grandpa offered his help. The uncle’s dad put it in the back of his pickup and brought it to Wichita Falls, where Grandpa ultimately ended up buying it. Grandpa was a mechanic, so Mom’s car history was full of odds and ends that he was able to keep running on the cheap. There was a Ford Falcon (which Mom called the “most powerless car I ever owned!”), a Mercury Capri that was fun but wasn’t kept for long because it had no air conditioning, and of course, a Volkswagen Beetle that Mom painted flowers onto. But no car was as fun or as memorable as the Isetta, and after driving the 1957 example at the Lane, I get why. It’s hard not to be instantly amused by the steering column that tilts out with the door. It’s the ultimate car party trick. Lots of doors swing upwards, but few are up front. 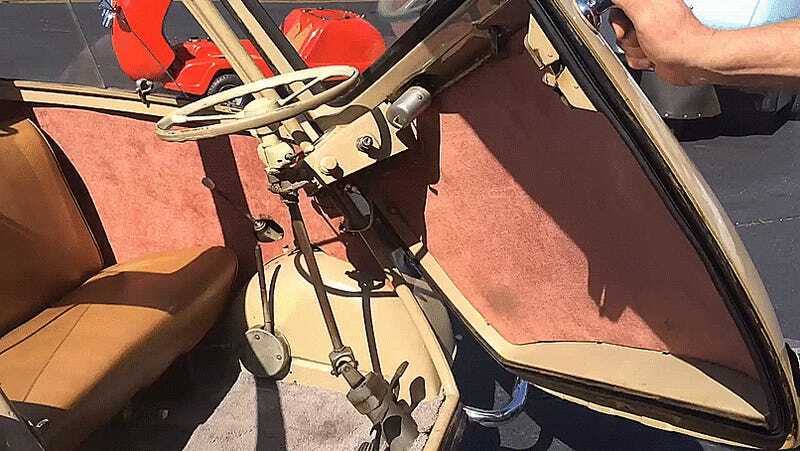 The Isetta is the only one I know of that takes the steering wheel along for the ride, as the Isetta’s patent on that trick steering column design prevented similar front-door microcars from copying it. Mom’s front door came in handy once. She and a friend mistook a patch of white fur sticking up in the middle of a dirt road for a fur coat. It wasn’t a very busy road, so they went home to get shovels to dig it up. They dug directly out the front of the car until someone came, at which point they jumped back into the Isetta, shut the front door drove off, probably while innocently whistling. Goat heist mode in Mom’s Isetta. Photo via Wanda Schrader. Whether you’re digging up livestock or simply out for a drive, the Isetta is surprisingly up for the challenge. For a tiny car, it’s downright cavernous in there. The Isetta looks and feels far roomier than it has any right to be, thanks in part to its patented steering column. Think of it less like a small car and more like a personal pod for two. The angle of the front door and lack of a true dashboard gives you miles of leg room. Aside from a small parcel shelf above the rearward engine, most of the space inside is dedicated to the occupants. Huge glass windows and a sunroof above made it feel like you were part of your surroundings instead of hidden away in a car, but it was enclosed enough to be pleasant. But it is a car, so it has to drive. This Isetta was particularly tricky. It has an H-pattern four-speed gearbox with a reverse gear on top of that, so it was more like a regular car than most of the microcars we drove (which often lacked a reverse gear). Most of these tiny cars are easy enough to pick up and move without needing a reverse gear—something Mom discovered when the boys at school would move her Isetta without her knowledge. The shifter is to your left in the Isetta, and boy, is it vague. Having to connect for a relatively long distance to the rear of the car is probably partially to blame—my Porsche 944 has a rear transmission and suffers from a similar flop. The shift pattern is even backwards, with first and second gear to the right of third and fourth. The pedals were small but easy to use, with a large postage stamp for a gas pedal and a clutch that was easy and forgiving to use. The brakes were not as grabby as modern discs, but they did the job, slowing down the Isetta’s tiny mass quickly enough. The Lane’s Isetta was acting up a little that day—stalling out easily on uphills, but it was easy enough to get going. It was powered by a tiny aircooled 298-cc aircooled four-stroke engine, the likes of which Grandpa used to repair with assorted motorcycle parts when actual BMW replacements were hard to come by in north Texas. Mom even used an old tablecloth as a sunroof cover. All 298 ccs of rattling fury was just enough for the teeny tiny rolling egg, though. It bounced into action hilariously fast when you really got on the gas pedal, lurching the nose up on its soft suspension. The ride inside was comfortable and smooth, and with the wider part in the front, it was a lot more stable in turns than you’d think. Because it was so small, it had a fantastically small turning radius. Having the engine behind the passengers but ahead of the rear wheels balanced the ride out well, too. Do not let its tiny size deceive you. The Isetta is the ultimate wacky go-anywhere, do-anything car. Keeping an Isetta running far from its home was certainly a handful for Mom and Grandpa alike, as you had to be resourceful whenever anything broke—but it sounds so worth it.